Clinton responded to the Islamic terror attack in Orlando in a speech on Monday in which she both claimed that it was not a day for politics and slipped in references to her political presidential rival Trump. She said it was past time for the governments of Saudi Arabia, Qatar, and Kuwait to stop allowing their citizens to fund extremist terrorists and to “stop supporting radical schools and mosques.” She claimed to be an ally of LGBT people. 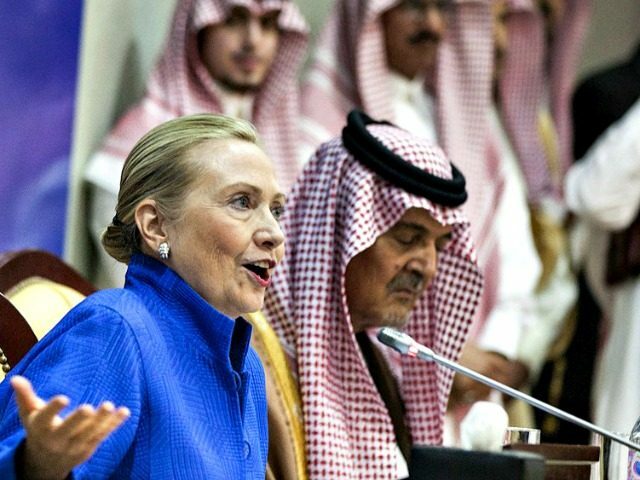 If you ask me about the Clinton Foundation — do I have a problem when a sitting Secretary of State and a foundation run by her husband collects many millions of dollars from foreign governments, governments which are dictatorships, you don’t have a lot of civil liberties with democratic rights in Saudi Arabia. You don’t have a lot of respect there for divergent opposition points of view, for gay rights, for women rights. Do I have a problem with that? Yeah, I do.